The Dapper Man is a hybrid retail concept, bridging the gap between a male barber shop and ladies hair salon in London. They specialise in classic grooming services, from scissor and clipper cuts to hot towel shaves, as well as more cutting-edge procedures in The Dapper Aesthetics Clinic, like teeth whitening, botox, fillers, and fat freezing. The money raised will go towards expanding these services, purchasing machinery for laser hair removal. 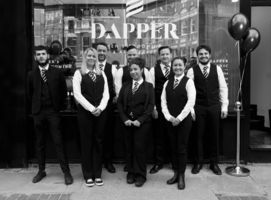 The Dapper Man, conveniently located in Ealing Broadway, is a high-end salon specialising in male grooming. We were established in 2015 with the aim of combining the classic services of a barbershop with the modern luxury of a unisex hair salon. Our treatments are performed by qualified and experienced barbers, stylists, and therapists, making your visit as pleasurable as possible as you walk out looking your best. This ranges from traditional haircuts and colour, hot towel shaves, to the latest treatments such as Brazilian Keratin for unruly hair. We also offer soothing massages, facials, waxing, and manicures-pedicures for optimal indulgence. Over time, we've grown and increased our services to include The Dapper Aesthetics Clinic. This is aimed at men and women who wish to remedy problem areas in a non-surgical way that has quick and proven results. This includes permanent laser hair removal, teeth whitening, and facial procedures such as botox, all carried out by medical professionals. We have recently ventured into fat freezing, using CoolTech equipment. This new technology delivers visible results after just 15 days, with only 1-3 treatments required. We're at the forefront of bringing this kind of technology into the salon market and see this as a great opportunity. We will use the funds raised to purchase the machinery we currently lease, particularly our laser hair removal equipment, enabling us to have a more stable return. In turn, we can continue to expand our business and deliver our excellent services with plans to open further locations. Q. What is going to change to see you run a profit, e.g. increasing income, lower costs, setup costs not recurring etc ? A. Thank you for your question. We are approaching profitability with reduced costs from soon to be paid off hire purchase agreements, reduced staff costs with improved schedule, and most importantly continued growth in revenue and customer base and focus on higher margin treatments such as laser hair removal, fat freezing and facial aesthetics. A. Thank you for your question. This is explained further in the same document, £73,978 is for hire purchase agreements for machinery and £302,389 a directors loan not falling due within 5 years. Q. Thanks. I mean the interest taken after EBITDA - what other loans do you have? A. Thank you for your question. This relates to other equipment lease agreement for machinery, allowing us to focus and grow on high margin treatments. A. Thank you for your question. We have experienced a 60% growth figure from 2017 to 2018. Financial figures for 2018 can be found on companies house and we're happy to supply a forecast for 2019. Q. How much spare capacity does the current staff and facilities have? A. Thank you for your question. Our current capacity is 60-65%, providing further growth potential with one extra station in the men's and ladies' section. Q. Can you share what the interest payments are for? A. Thank you for your question. This will finance equipment at a more reasonable rate than other asset finance providers. Q. Well done for showing on the google searches. May I ask how the losses are funded? A. Thank you for your question. Current losses are funded by the director and we are expecting to be profitable by April 2019 after 3 years. "Combining classic barbershop quality with modern services"